How do we understand the economics of water, the politics of water, the social history of water in this place? Furthermore, how might we then think theologically given our understanding of these social dynamics involving our common practice in water? Indeed, because water is so common a reality, it necessarily has its own history within each and every community. If we ignore this social particularity of water, we find ourselves simply talking to ourselves with our own inherited symbolism, “preaching to the choir” as it were rather than “joining in the chorus.” Let me illustrate with some of my own experiences of water among a variety of communities where I’ve served. One day in chapel in a seminary where I taught in the United States, ecologically concerned students and a member of the faculty had decided to lead an environmental worship service focusing on water. They read passages of scripture and sang hymns with images of water. The sermon emphasized the importance of conserving fresh water and included practical suggestions to avoid wasting water. None of the students, though, recognized the fact that they were preaching and singing on top of a polluted aquifer that was being cleansed at great public expense as a federal Superfund site. This lack of attention was despite the location of the pumping and cleansing station immediately across the street from the seminary and the presence of monitoring wells all around the neighborhood. A munitions factory in the community’s history had allowed organic solvents to leach into the aquifer. The problem was being contained by pumping the polluted water out of the aquifer at a faster rate than it could spread and then using carbon filtration to remove the carcinogenic compounds. This process provided all the drinking water for this municipality—and then some. Because the water had to be pumped from the aquifer and filtered at a fairly fast rate as a matter of pollution control, there was clean water to spare—more than the municipality could use. If neighboring municipalities did not need it, it was simply cleansed and discharged. Preaching conservation in this particular situation seemed to me ironic—well-meaning but misplaced, misinformed due to being de-contextualized. "This is amazing what you do! You take this toxic water, literally death-dealing poison, and you turn it into safe, healthy, life-giving water. I’m wondering: Are you a member of a church, a part of a worshipping community? And do they know what you do—that you literally take waters of death and turn them into waters of life? What a blessing you provide! Do they recognize this ministry you do? Do they celebrate it and honor you for it and pray for you in doing it?" The technician looked at the teacher with quiet surprise. He was a regular member in a congregation, but it had never occurred to him that his work was a ministry that others might want to affirm and to celebrate as God’s work. Such an honoring, though, or even commissioning, I am suggesting, would be a relevant theological response informed by a contextualized analysis of water in that locale. It would be much more appropriate, moreover, than a message about water conservation--even if that message were generally true and genuinely offered but not contextually informed. As I think further about water in other contexts in which I have served, I am aware that the particular contexts of water have occasioned analyses that in turn have prompted theological insights. As mentioned earlier, I served in the Pacific islands at the Pacific Theological College in Fiji which had a faculty and a student body from throughout the islands of Polynesia, Melanesia and Micronesia. In that context, I became aware that there are tens of thousands of islands throughout Oceania—an area covering approximately a third of the planet’s surface. Yet, there are remarkable cultural similarities throughout the region; the indigenous people as far apart as Hawaii and New Zealand, for instance, can understand much of each other’s language. The symbol of the Methodist Church in Fiji and Rotuma is an outrigger canoe with a cross on its sail—a variation of the boat widely used to symbolize church ecumenically and historically. The church spread by sea and by sea travelers, by boat. Growing up on a continent, I had always thought of islands as being separated by water. Once immersed in the Pacific, however, I came to see islands as connected by water. Water is the highway between islands. It is the means through which people travel and the means by which the gospel travels. A familiarity with the ways in which water has historically connected the peoples of the Pacific has consequently expanded my theological understanding of what it means to be a gathered church, a connectional church, and a missional church. Though gathered in congregations, we are connected historically and continually—even with sisters and brothers beyond the horizon. Moreover, there is no place so isolated that it is beyond the reach of God’s saving grace. I have become more aware of Biblical references to islands and coastlands, such as Psalm 97:1 which exclaims, “Yahweh is king! Let earth rejoice, the many isles be glad!” My neighbors in the Pacific would interpret to me this reference to isles as a declaration of God’s sovereign love toward them in particular, as an indication of God’s regard for them from the very beginning (from even before the arrival of Christian missionaries), as a connection between them with God’s activity throughout the world, and as inspiration for their own missionary activity carrying this proclamation of God’s sovereignty to others. Water is not a barrier but a bond between the peoples populating the Pacific, connecting them with each other, with the entire ecumenical church, and with the rest of the world. There is great worry throughout the Pacific concerning global warming contributing to rising sea levels which, in turn, would make many of the lower lying islands uninhabitable. A key factor in an island’s habitability is the presence of potable water. Habitable coral atolls maintain a lens of fresh, potable water. Rising sea levels threaten this supply of fresh water with salinization. The primary cause of this problem is the increase of greenhouse gases, such as carbon dioxide, generated primarily in the industrialized and industrializing areas of the world. Internationally, the nations of Oceania tend to be very supportive of multilateral measures to reduce greenhouse gas emissions. Locally, though, the inhabitants of low lying atolls are not without some power. Atolls are protected by a fringing reef which is alive with coral. Corals grow slowly, but a healthy reef will grow faster than an unhealthy one. Reefs are key to the production of sand forming the atoll itself and key to the protection of that atoll’s fresh water lens. Reefs can be damaged, however, by over-exploitation (such as the harvesting of coral rock) and by pollution (such as the release of sewage or fertilizers). Corals are actually the result of a symbiosis between the invertebrate coral animals themselves and particular algae called zooxanthellae that thrive in nutrient-poor water. When the waters surrounding a reef become over-fertilized, other algae out-compete with the zooxanthellae to the coral’s destruction. A community of people living on an atoll can give their island the best chance of survival by maintaining a lifestyle consistent with sound reef ecology. At the Pacific Theological College while I was there, the curriculum attended both to the importance of advocacy in international forums for regulation of industrial activity and to the importance of local practices of stewardship for people living literally on the balance between water and land. This contextualized analysis of reef ecology has theological implications. This became apparent to me in Fiji unexpectedly with regard to the subject of Sabbath observance. Most indigenous Fijians take very seriously the observance of Sabbath on Sunday. Sunday is called “Siga tabu,” or “holy day.” It is a time for church and for fellowship. It is not a time for work or commerce. People dress in their Sunday finest for church. In recent years, there was even a “coup d'etat” in the Fijian Methodist Church over the issue of national laws pertaining to the Sabbath. To visitors from places that were historically a part of Christendom, this all looks anachronistically familiar. One might be reminded of nineteenth century customs about Sabbath observance in Europe or America which are more relaxed now. I thought I knew about Sabbath observance in Fiji because of my familiarity with Sabbath observance in my own culture and because of the apparent similarity between the two. One Sunday, I was walking on the reef at low tide. I stooped down occasionally to catch small tropical fish caught in tidal pockets in order to look at them more closely and to appreciate their beauty. A Fijian man observing from an adjacent bluff called out to me and respectfully asked me to stop “collecting.” In fact, while very courteous, he was quite insistent. “It is Sunday,” he explained, “the reef needs to rest.” I was surprised by his explanation. I thought I knew about Sunday. I realized at that moment, though, that the Fijian Siga tabu has as much to do with a particularly Fijian understanding of tabu and the Fijians' own history of life on the land within these reefs as it did with any Western traditions or even with the Biblical roots of Sabbath observance. The observable familiarity of the form of Sabbath observance to my eyes had actually obscured the subtle but profound difference in its meaning across cultural contexts. Given the problem of rising sea levels, however, an understanding of reef ecology gives heightened prominence to this Fijian understanding of Sabbath and of community—that the living and worshipping community on Sunday and on any day includes the reef, that the reef along with the human recipients of God’s mercy is given the Sabbath, that Sabbath is for both human rest and reef recovery. These examples pertaining to water illustrate the importance of deepening exploration of contextualized experience in order to inform theology. Water is pervasive in human experience. The particularities of water in a given context, however, provide a bridge to further analysis, whether: polluted aquifers transformed into potable water, islands connected by canoes and historical patterns of migration, rising sea-levels and the ecology of reefs. In each instance, the particularities of a local situation guide the direction of further exploration and analysis. This exploration and analysis then opens theological reflection to new, contextualized insight. In these examples, this process led to new contextualized insight about theology of vocation, ecclesiology, and Sabbath respectively. Options for the church’s practice and ministry might flow from these insights. Some of these have already been mentioned. In the first example about the aquifer, the teacher suggested that the technician’s congregation could celebrate his life-giving work as vocation. Indeed, such celebratory acknowledgment of the laity’s vocation in the world could be ritualized much like the church celebrates the vocation of those being ordained to ministry of Word and Sacrament. In the second example about ocean passage between islands, we began to consider the implications for an ecclesiological understanding of ecumenical and historical connection. This might have implications for the ways we engage in mission and the ways that we might hold ourselves accountable to a broader understanding of church. In fact, the Pacific Theological College developed a program for mission training and exchange of mission personnel called “God’s Pacific People,” with the starting premise being this very understanding of connection between the islands. The third example, concerning Sabbath rest for the reef, as we noted, has practical implications both locally and globally—for the practice of sound reef ecology by communities inhabiting fragile atolls and for the practice of advocating for international measures to curb the emission of greenhouse gasses. 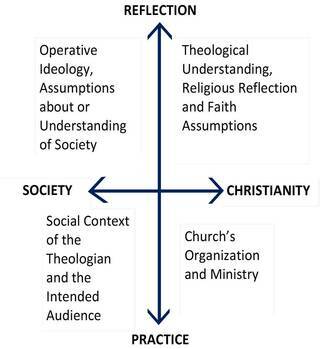 In each instance, we have travelled around the pastoral cycle: from (1) solidarity with people in an actual community, to (2) an analysis of the social significance of water in that community, to (3) theological reflection informed by that analysis, to (4) implications for ministry drawn from that well of theological reflection.